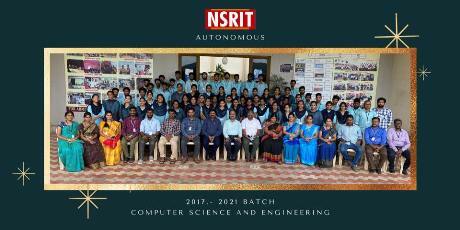 Nadimpalli Satyanarayana Raju Institute of Technology (Formerly Known as VITS College of Engineering) was established in the year 2008 by Sree Veera Venkata Satyanarayana Educational Society. NSRIT offers quality education and technical competencies on the strong foundation of values, ideals and rich culture to the students across the country and beyond. NSRIT attempts to integrate classroom learning with industry exposure to ensure the application of knowledge during the course of study it self. The objective is to prepare young students to act as leaders for the promotion of the economic and industrial growth of the country and to play a creative role in society. We focus on imparting skills on cutting - edge technologies to our students. Quality research in the areas of science and technology is given considerable importance here. Our major strength comes by forging strong industry - academic linkage. The institute celebrates freedom of taught, cultivates vision and encourages growth and also inculcates human values and concern for the environment and society.